One Eternal Day: Arsenic or cyanide? ...[L]eading the reader into this treasury of malevolence, is Raymond Bond's introduction — as exhaustive as it is entertaining. With lively authority, he discusses not only the great poisoners of history, but also nature's own — the snakes, fishes, insects, trees, plants, etc. 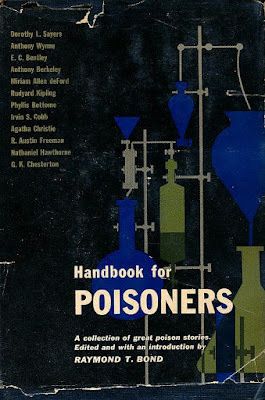 And to sum it up, he lists twenty poisons common to fact and fiction, with symptoms of each. ...[A]ll poisonous snakes may be classified on the basis of their venom. Broadly speaking, their poison is either neurotoxic and attacks the nerve elements of the body, or it is hemotoxic or hemolytic and breaks down the blood and the tissue. In many instances, the same venom seems to contain both toxins to some degree. ARSENIC (or arsenium) — A steel-gray brittle metal, odorless and tasteless, and found with the other metallic minerals in the older rocks. In combination with sulphur, arsenic occurs naturally as realgar and orpiment. 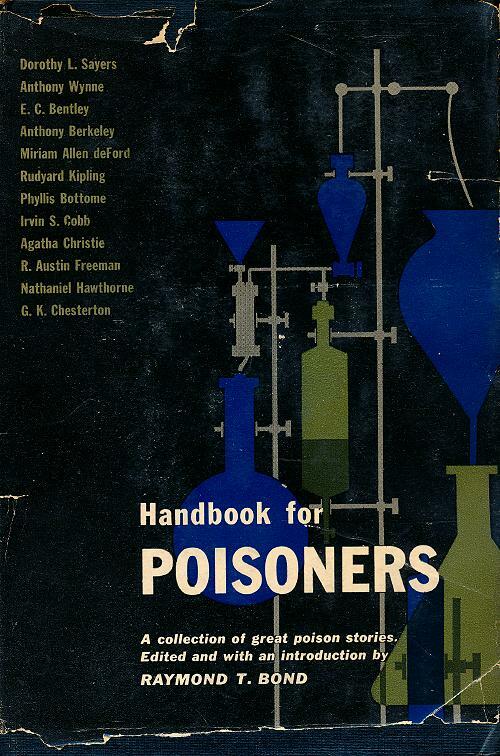 Arsenic and its soluble compounds are exceedingly poisonous, as mystery-story readers have learned. In its various forms, it is used in the production of green pigments, in glass and wallpaper manufacture, in dyes, in insecticides such as Paris green, flypapers, fruit sprays, and in rodent poisons. Arsenious oxide, sometimes called white arsenic, has an astringent sweetish taste and is white or porcelainlike in color. In addition to its popularity in commercial poisons, it is used in medicine for treating skin diseases, in malarial fevers, neuralgia and asthma. Limited amounts of arsenic have been used by women for many years in cosmetics and by men as a stimulant to increase their power of endurance. Symptoms of arsenic poisoning appear within an hour—a burning in the throat, stomach pains, cramps, pallor, shallow breathing, thready fast pulse, coma, convulsions and collapse. I assume all of this sort of information is available from many other sources. If not this would be a rather disturbing "handbook." But for someone who reads Christie, or Sayers, or any number of others, or watches crime films or TV, it provides interesting background. Unfortunately the book is out of print, although both used hardbound and paperback editions can be found online at Amazon and elsewhere.